Originally built as the family home of Abram and Helen Hobson in 1907, the Hobson house was a craftsman style structure of all wood construction located in the small town of Nordhoff, California. This home featured a stunning fireplace constructed from handmade ceramic tiles and a beautiful built-in sideboard including a long serving surface and a china cabinet. These two original architectural features can still be viewed in the Council Chambers today, which occupies the original parlor and dining room of the home. Some year’s latter, Ohio Glass magnate and Ojai visionary, Edward Drummond Libbey, persuaded the town leaders of Nordhoff to perform an architectural over hall of the town. 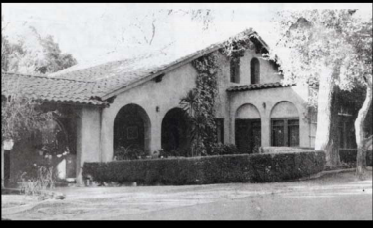 In 1917, Libbey contracted with the San Diego based architectural firm of Frank Mead and Richard Requa to redo much of the western-style architecture that existed in the downtown area into the mission revival style. This included building the Spanish style arcade on the storefronts along the main street, and a new post office with its iconic bell tower. Both of these architectural features help to define our community’s charter to this day. The reinvention of the town was complete with the change of its name from Nordhoff to Ojai. While the mission revival style architecture was becoming so prevalent in Ojai, the Hobson family also sought the help of the San Diego architect firm of Mead & Requa to redesign their home. In addition, the builder of the arcade, Robert Winfield, was hired for this renovation. By 1925, the remodel of the Hobson home was complete. The original craftsman style home was transformed into a Spanish style home with beautiful arches and wide patios. A smaller Spanish style guest house was also built, located immediately to the west of the original home. The two structures were connected by walkway under a wisteria covered pergola supported by stucco covered columns. In addition to the homes, the grounds of the estate now included a tennis court, a miniature golf course, and formal gardens. What had started as a rather simple structure had truly become a splendid estate. After the passing of Abram Hobson in 1929, his daughter Grace and her husband Fred Smith took up residence in the guest house so Grace could be near her mother, Helen Hobson. Then early in the 1970s, after Grace’s death, Fred Smith, generously donated the Smith-Hobson estate to the city of Ojai as a gift on the behalf of the Smith-Hobson family. Once again, the Smith-Hobson home would undergo a transformation. Award winning local architect, Zelma Wilson, was charged with the task of combining the two houses into a single structure. Zelma Wilson was able to masterfully create a space that was appropriate for municipal offices while maintaining the character of the Mead & Requa design. In 1976 the Smith-Hobson estate became the new home of Ojai City Hall. Today, Ojai City Hall is perhaps one of the most unique and beautiful government office buildings in the state of California.